I've zoned an incredibly minor/inconsequential hack for Micro Machines (literally, one byte). This sets Player 2's controller to joystick by default, so a keyboard isn't needed to play two player (so this makes it more suitable for AmigaLive, CD32 compilations etc. 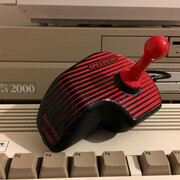 With this you can immediately play two player with no keyboard, before you needed a keyboard to at least set player two's controller to the joystick). WHDLoad and ADF versions included. I figured it wasn't worth opening a whole new topic for every little thing like this that I do (and I'm planning a few more, primarily to support my CD32 2 player collection). Damien (or if another Admin sees this), can you please change the topic here to something like "Earok's minor hacks" or the like? Cheers. Regarding Vroom, I'll keep it in mind, but I'm not really sure there's much I could do with it. Adding accelerate to fire two might be an option (though it wouldn't help with the Speed King? I assume there's only one fire?) but setting it to fire one for example would mess with gear shift controls. Any chance to set Zool OCS (Whdload) to music instead of sfx by default?, CD32load doesnt seem to work to button assign with it. Most versions of the game have an annoyingly fast timer, though this was fixed for the A1200 Magic Pack version. I've simply applied the timer setting for the A1200 Magic Pack version to the OCS version. Posted the Whizz hack, as well as a minor hack for both SWOS 96/97 and 16/17 (HDD edition only - NOT to be confused with WHDLoad edition though it may be compatible by swapping the SWOS2 file). @earok: the link for SWOS Hack lead to MEGA, but it is impossible, to downloaded it! "0 file downloaded" after the choose of the right place for download! Republished the "Alien Breed Tower Assault HDD Edition" pack. It's not really a hack per-se but I figured it could go on that page. What it adds is the intro video (AGA and ECS) and outro video (AGA only) from the CD32 edition to a copy of TA that can be played from a hard drive. New (EXPERIMENTAL) minor hack has been zoned. This is for Beach Volley WHDLoad install, it allows for play without a keyboard. Press Fire 1 to start a 1P game, Fire 2 to start a 2P game. I will ask Codetapper to simply add that functionality to the WHDLoad slave, but in any case if anyone needs it (for a CD32 compilation etc) it's here. EDIT: I've temporarily pulled it from the zone, Codetapper is going to look at it so there's no point of my hack being out there if it gets added to the slave. Last edited by earok; 09 January 2019 at 09:15.